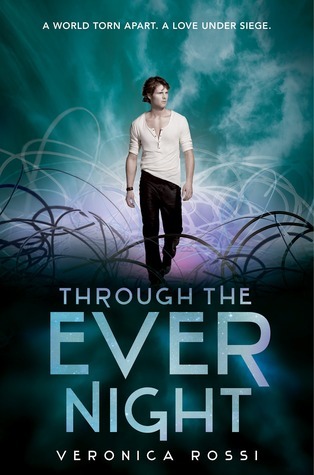 If you thought that the story of Peregrine and Aria was as good as good could get when they came together in "Under The Never Sky", you have but to crack the cover of "Through the Ever Night" to realize how wrong you were. Determined to return home to rule as Blood Lord of the Tides with his lady love at his side, Perry is in a for a rude awakening if he expects Aria's transition from dweller to clan member to be anything less than hell. As it turns out, circumstances quickly degenerate from bad to deadly for poor Aria, forcing her out of the clan, away from Perry, and on a mission that could prove to be little more than a deadly search for fool's gold. are along for the ride. The strong bonds of friendship formed between Aria and Roar are a joy to watch and serve as both a bridge to Roar's back story and a soft place for harried readers to land when the action gets intense. Both the dreaded Hess and his son Soren make themselves useful as seriously evil and annoyingly self serving aspects of the plot. What else is there to be said there except lie, lie, lie, manipulate, coerce, and dangle loved ones as bait. Add Liv, Roar's not so lost love into the mix, and a delicate game of thrones that if not played right could spell the end for the Tides and all the Perry has fought for; and you have the "OMG this is the best book ever goodness that is "Through the Ever Night". There have been no outright changes to the wonderful world that was so lovingly crafted within the pages of the first book. There have only been improvements. The addition of the Tides' lands being one. The growing frequency and intensity of the aether storms make it more than clear that time is running out for everyone and provide a natural stop watch that makes each new discovery or set back experienced all the more important. This is a sequel that does nothing but shine in the face of what has proven to be stellar first book in the form of "Under the Never Sky". Loaded with lyrically fluid writing, a strong and well charted plot, and characters possessed of both depth and humor. "Through the Ever Night" is a tale destined to enchant the masses for years to come. I'm about 85% through -- can't stand to put it down. I very much agree with your assessment, even though I haven't finished! Loving it. Because of y'all's mad ravings about this series, I borrowed book 1 from the library. At least I'm comforted with the thought that my time won't be wasted reading it. This sounds like a great series. I really need to read it. I'm dying to start reading this series, I have heard really good things about it. I loved Through the Ever Night. I think I liked it more than Never Sky. The characters just seemed more fleshed out.